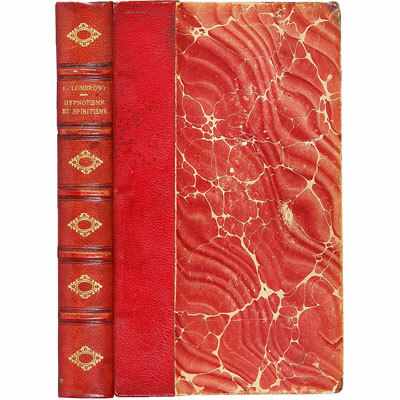 Hypnotisme et Spritisme - César Lombroso 1911 - Ernest Flammarion, Paris - Published a year after the first edition. Scarce work of hypnotism, spiritualism, paranormal phenomena, mediums, haunted houses, by the father of modern criminology. In French. Cesare Lombroso (1835-1909) devised the now-outmoded theory that criminality is determined by physiological traits. Called the father of modern criminology, he concentrated attention on the study of the individual offender. In 1876 he published a pamphlet setting forth his theory of the origin of criminal traits. In the study, later enlarged into the famous L'uomo delinquente (5th ed., 3 vol., 1896–97; partial tr. as Criminal Man, 1911), he compared anthropological measurements and developed the concept of the atavistic, or born, criminal. In his later works, less importance was given to that concept. Although the scientific validity of the concept has been questioned by other criminologists, Lombroso is still credited with turning attention from the legalistic study of crime to the scientific study of the criminal. Lombroso advocated humane treatment of criminals and limitations on the use of the death penalty.